Pneumatica is an event about air, made of air and powered by air. The Squonkers pump up the volume with live original music that permeates the air, while inflatables pump up and immerse the audience. 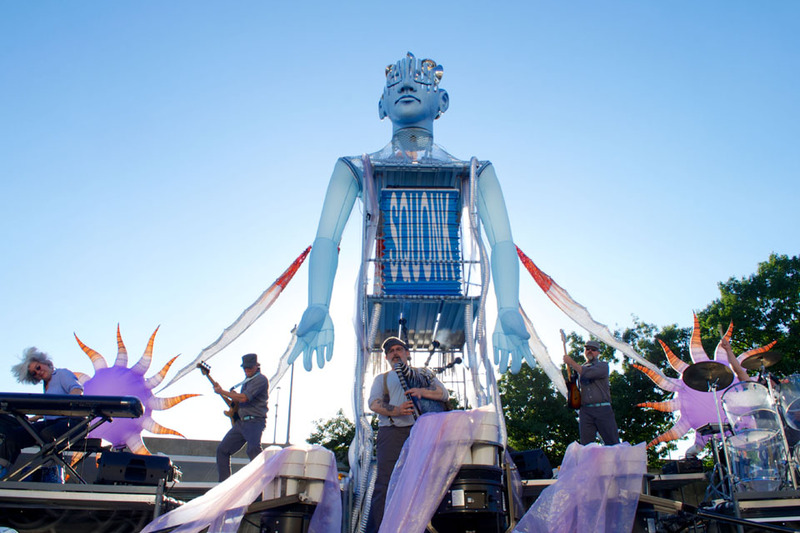 Figures and tentacles grow, powered by blowers and vortex fans, and culminate in the 40-foot high Lady Pneumatica who incorporates a wind turbine on her head. She blossoms with sails, breathing steam and raising her inflated arms to the sky. 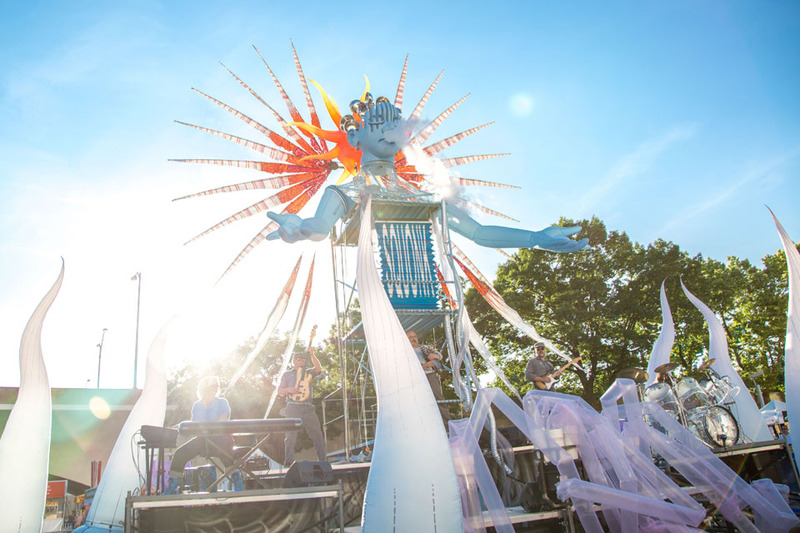 Squonk’s music incorporates the swoops and eddies of air with electronic bagpipes and a vertical accordion that is Lady Pneumatica’s lungs, played like a piano while it rises and falls with her breath. Playing with visual puns, air is used to activate costumes – Squonkers inflate like blowfish and musically activate headtubes with wild guitar and bass riffs. With the creation of Pneumatica, the Squonkers continue to pursue the most American and democratic of art forms: the public celebration, with boisterous music and surreal image. Squonk taunts and whispers, bellows and caresses, using the very medium of sound: air. 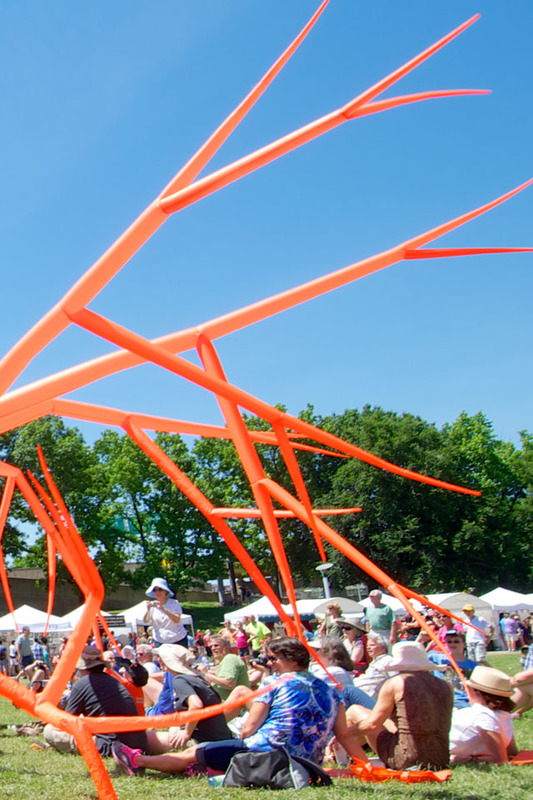 Squonk's Pneumatica is an event about air, made of air and powered by air. The Squonkers pump up the volume with live original music that permeates the air, while inflatables pump up and immerse the audience. Music by Jackie Dempsey with Squonk Opera. 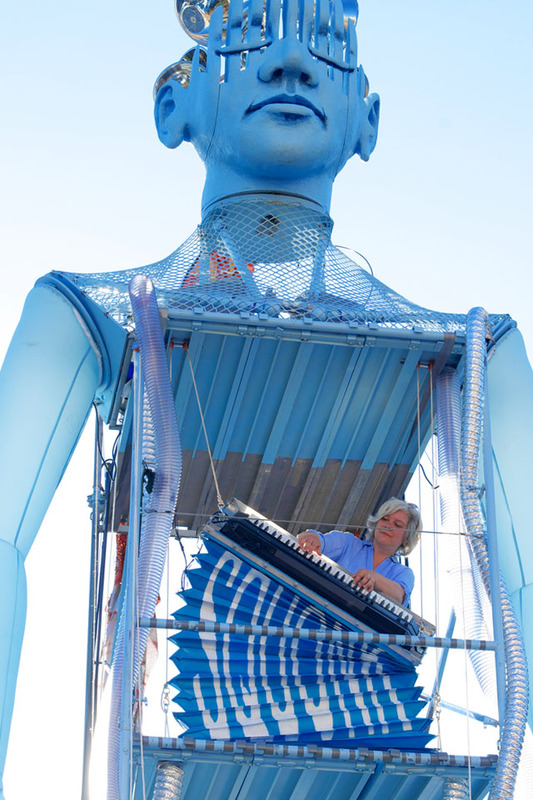 ©Squonk Opera 2014. Pneumatica will be an event about air, made of air and powered by air. The Squonkers will pump up the volume with live original music that permeates the air, while inflatables pump up and immerse the audience. 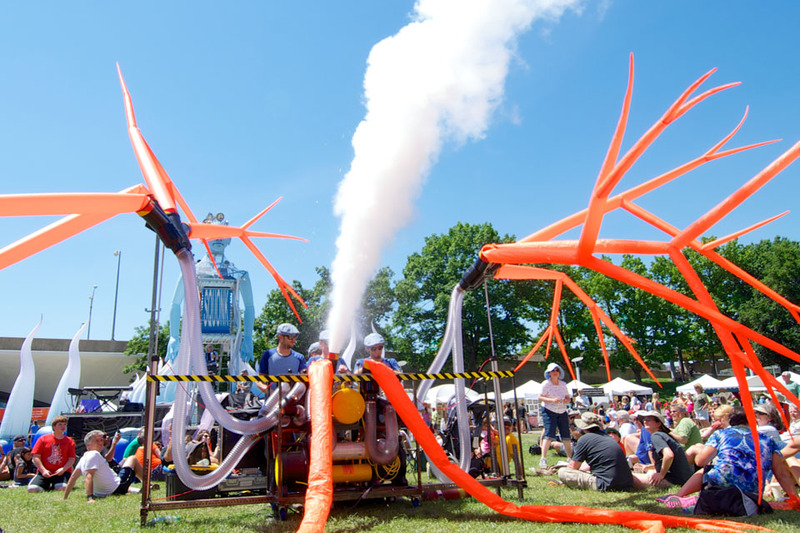 Figures and tentacles will grow, powered by blowers and vortex fans, and culminate in the 40-foot high Lady Pneumatica who incorporates a wind turbine on her head. She will blossom with sails, breathing steam and raising her inflated arms to the sky. 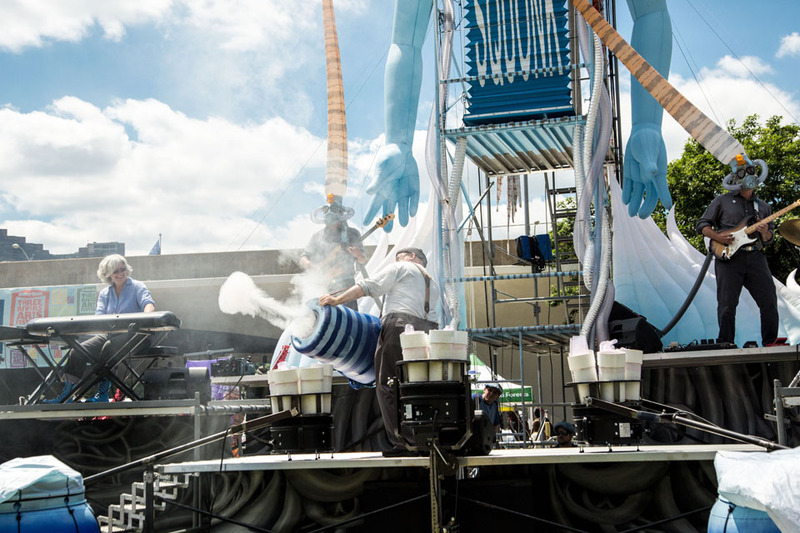 Squonk's music will incorporate the swoops and eddies of air with electronic bagpipes and a vertical accordion that will be Lady Pneumatica's lungs, played like a piano while it rises and falls with her breath. Playing with visual puns, air will be used to activate costumes -- Squonkers will inflate like blowfish and musically activate headtubes with wild guitar and bass riffs. With the creation of Pneumatica, the Squonkers continue to pursue the most American and democratic of art forms: the public celebration, with boisterous music and surreal image. Squonk will taunt and whisper, bellow and caress, using the very medium of sound: air.